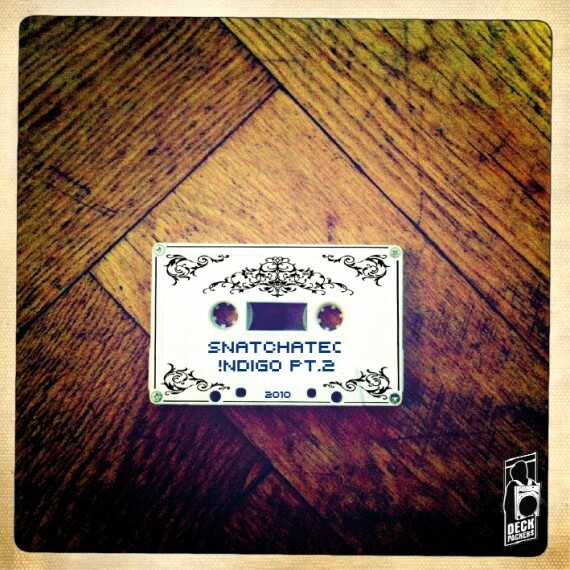 Just over 3 years ago when I first started helping Mr Trick with Rhythm Incursions we aired a guest mix from Germany’s Snatchatec called Indigo – a mix CD the man had self-released. Snatchatec was a long time collaborator and friend of DJ Scientist, who runs Equinox records. Together they did a project called the Dedicated Beatheads in 2007, which we aired on Turntable Radio. Our own long standing relationship with Scientist is how the hook up for Indigo came to happen. The mix proved one of our more popular mixes in 2008, and was a perfect example of Snatchatec’s deft mixing and scratching and ear for cinematic selections. You can still listen to and download Indigo right here. Sometime towards the end of last year Snatchatec got in touch again to say he’d done a follow up to Indigo and would we be up for airing it – the answer to which was of course yes. In that time, he’s continued to work with Scientist and Equinox records, with whom he’s toured and recorded, as well as his own Deckpackers project. Most notably he provided a remix for Scientist and Ceschi’s Same Old Love Song 12″ release in 2009. So ladies and gents to kick start February we’re very happy to bring you Indigo pt.2 – another hour long ride into the finest beats and productions of recent years, with a truly cinematic feel that’s hard to resist. The mix features plenty of producers who have long been friends and favourites of ours here at Rhythm Inc towers, from Sixtoo and former presenter Joey Beats to Maker, Ooah, edIT, Scientist, 2econd Class Citizen and Mochipet. As always you can stream and/or download below or simply subscribe to the RSS/iTunes/newsletter and get every show directly in your inbox. Many thanks to Snatchatec for the mix. For more on the man check his myspace and his own website. This entry was posted on Tuesday, February 1st, 2011 at 11:55 am. It is filed under Podcasts, Guest Mixes and tagged with Mochipet, Quantic, Snatchatec, Scientist, Sixtoo, edIT, Joey Beats, Controller 7, Maker, Daedelus, Four Tet, 2econd Class Citizen, Pretty Lights, Deceptikon, Hint, Think Twice, Deckwreka, Ooah, Ghost, Meaty Ogre. You can follow any responses to this entry through the RSS 2.0 feed.